Measles Outbreaks Prompt More States To Restrict Vaccine Exemptions : Shots - Health News Following several measles outbreaks this winter, there is a movement among some states to make it more difficult for people to claim nonmedical exemptions to vaccine laws. A combination vaccine against measles, mumps and rubella protects kids against all three illnesses with one shot. At the same time, beyond medical exemptions, most states also allow parents to opt out of this vaccination requirement for religious reasons. And 17 states permit other exemptions — allowing families to opt out of school vaccination requirements for personal or philosophical reasons. Michelle Mello, a professor of law and health research and policy at Stanford University, says the bar for claiming an exemption from vaccine requirements has been very low in many states. "You can believe that vaccines don't work or that they are unsafe or they simply fly in the face of your parenting philosophy," she says. But this winter's outbreaks of measles across the nation are resulting in challenges to many exemptions: At least eight states, including some that have experienced measles outbreaks this year, want to remove personal exemptions for the measles vaccine. And some states would remove the exemption for all vaccines. Most of this year's measles cases have been among children who were not vaccinated against the virus. Once considered eradicated in the U.S., measles has sickened at least 159 people since the start of 2019, according to the Centers for Disease Control and Prevention, in outbreaks ranging from Washington and Oregon to Texas and New York. Last year, there were 372 reported cases of measles nationwide. 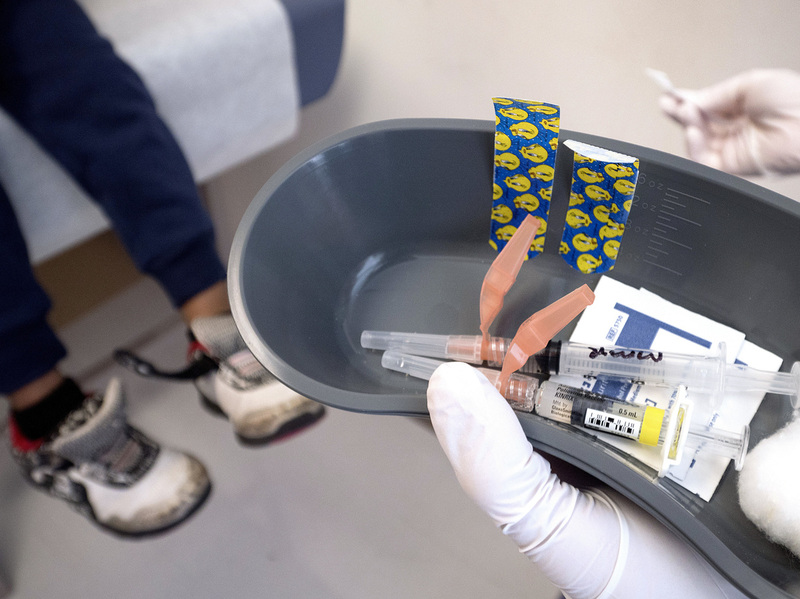 The move among state legislatures to tighten vaccine requirements is good news to Diane Peterson, the associate director for immunization projects with the pro-vaccine advocacy group Immunization Action Coalition. "Measles is not like a common cold," Peterson says. "Children get very, very sick and can be hospitalized," she says, adding that measles can even lead to death. The virus is highly contagious, airborne and easily spreads. It can survive in the air for a couple of hours. "A patient with measles can go to the doctor, cough in the exam room and two hours later another patient coming into the same exam room can be infected," Peterson says. The virus is spreading fast this winter, she says, because of the "pockets of children who have not been vaccinated, mostly due to parents who have decided not to vaccinate them." This leaves not only those unvaccinated school children vulnerable to the virus but also many adults who have suppressed immune systems and infants who are not old enough to be vaccinated. According to the Association of State and Territorial Health Officials, bills to restrict exemptions are now pending in a growing number of states. None of this sits well with activists who want their states to maintain personal and philosophical exemptions. "Nobody should sit in judgment of another person's religious and spiritual beliefs," says Barbara Loe Fisher, a spokesperson for the National Vaccine Information Center, a group that lobbies against mandatory vaccination and thinks parents should have a choice. "No person should be allowed to force someone to violate their conscience when they're making a decision about the use of a pharmacological product that carries a risk of harm." The scientific consensus about any risk from vaccines is that serious side effects are extremely rare. A suggestion that immunization might be tied to severe consequences like autism was debunked years ago, after findings supporting that link were proved fraudulent. Mello, the Stanford law professor who has been following the exemption debate, notes that the courts have repeatedly held that when a public health intervention is necessary to safeguard the public, individuals generally can be required to give up some personal liberty, particularly if that liberty is tied to a government benefit like school. The California state Legislature made that decision in 2015, less than a year after the state experienced a significant measles outbreak that got its first foothold among unvaccinated children visiting Disneyland.